With the weather here in Florida being super hot, I seem to always be craving something cold. Now this doesn’t mean that I need to be running to grab froyo from the freezer at each moment I get, but it sure does sound tempting. Instead of reaching for something cold that isn’t healthy for you, I have been making smoothies that are filled with fruits, veggies, healthy fats and protein. Finding a balance of what foods you like and the nutrients your body needs is extremely important. Start by assessing what fruits, vegetables, and sources of healthy fats you like the most. Healthy fats consist of coconut oil, avocado, nuts and almond butters. I try to stick with fruits that are higher in antioxidants, such as berries, and vegetables that are high in iron, such as spinach. Once you know which sources you truly enjoy, start coming up with creative combinations – this is my favorite part. 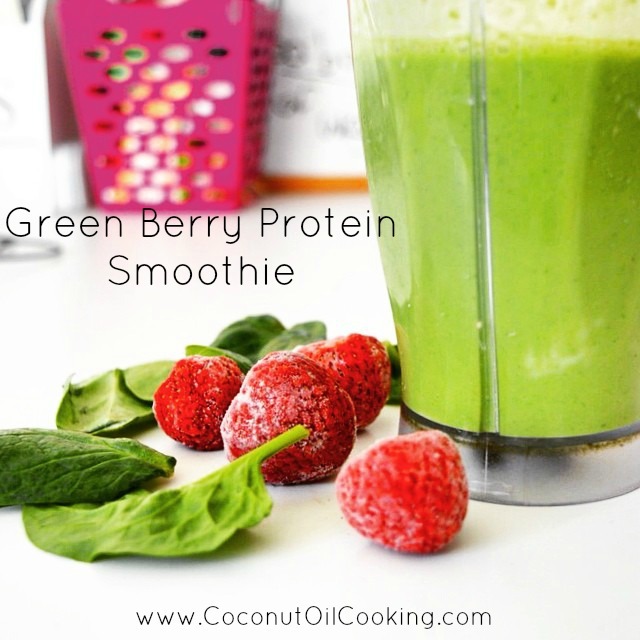 I chose to add coconut oil into my smoothies to really get added energy from the medium chain triglycerides. This avo-nut smoothie contains avocado, coconut oil, fruits and spinach for a powerful boost! I didn’t need to add ice since the berries were frozen, however you can definitely put ice in with this if needed. Remember that you can add in chia, flax, or hemp seeds for added nutritional value. Base the measurement of coconut oil on the amount of healthy fats that you would like to consume that day. Feel free to omit the protein powder if you’d like to stick with a fruit smoothie instead. For more recipes, try our Almond Joy Protein Smoothie or Pumpkin Breakfast Smoothie – yum!